Are Sweet Potatoes Bad For You? No, sweet potatoes are not bad for you in the least. They do have some calories and sugar (medium range on the glycemic index), but for most this shouldn’t be a concern. Very healthy and numerous health benefits. Side effects are rare. Things rated an ‘A+’ are typically necessary for survival (for example, water). Very healthy and numerous health benefits. A few harmful qualities may be associated, but only under certain circumstances such as an allergic reaction, Very healthy and numerous health benefits. Harmful qualities may be associated, but aren’t usually serious. It is important to note that even the best things in life can become bad in immoderate amounts. So, although something may be rated an ‘A+’, overconsumption/overdoing can bring unwanted effects. Very beneficial to your health. Things rated a ‘B+’ may have a few harmful qualities to pay attention to. Overall beneficial to your health. Things rated a ‘B’ may have some harmful qualities to pay attention to More beneficial to your health than not. However, harmful qualities are most likely associated and shouldn’t be overlooked. The main difference between category ‘A’ and category ‘B’ is the harmful qualities typically present in ‘B’ items. Serious side effects are usually uncommon, but are still possible and should be taken note of. Both beneficial and harmful qualities associated. Things rated a ‘C+’ are typically a bit more on the beneficial side. Still, moderation is important. A fairly even ratio of beneficial and harmful qualities. Moderation is important. Very general topics that can lean toward both sides of the spectrum will be placed here as well. Rice, for example, can be good or bad depending on the type. .More harmful than beneficial. Side effects are common, especially when consumed/done excessively. Moderation is very important. Harmful to your health. Although benefits may be associated, the bad most likely outweighs the good. Moderation is very important. Harmful to your health. A few benefits may be associated, but the bad outweighs the good. Moderation is extremely important. Sweet potatoes are rich in many essential nutrients all the while containing a modest amount of calories and sugar. 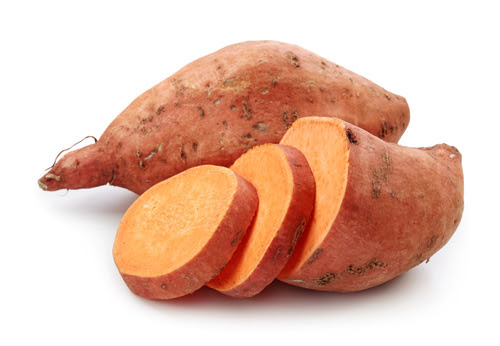 Although sweet potatoes have more sugar than white potatoes, they are among the best sources for vitamin A, with one cup (200 grams) of sweet potato yielding over twice the daily recommended value. 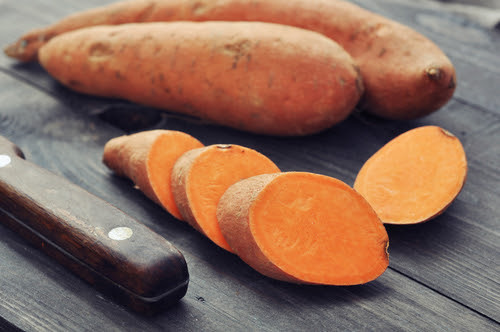 Vitamin A, a product coming from the carotenoids that are in sweet potatoes in abundance, is essential for healthy eyes and helps protect against the effects of aging as well as helping to fight free radicals that induce cancer. Another vitamin found in sweet potato is vitamin D, which is important in maintaining healthy skin, bones, and keratin. Also, there may be a link between seasonal affective disorder (SAD) and vitamin D deficiency. Also of importance is the abundance of B-complex vitamins found in sweet potatoes. Two of them, pantothenic acid and biotin are responsible for converting fat to energy and regulating blood sugar levels, respectively. Necessary for the circulatory system and inducing relaxation is magnesium, a vital mineral of which perhaps on the order of 80% of North Americans are deficient. As mentioned above, sweet potatoes are rich in carotenoids. According to a study conducted by Harvard of over 100,000 people, those who ate a regular diet rich in carotenoids were over a third less likely to be at risk for lung cancer. While sweet potatoes may not be the best thing to eat in terms of losing weight, they aren’t so heavy in calories and sugar as to put you over the limit if you are watching what you eat in the first place. When seen in terms of the sheer amount of nutrients provided, sweet potatoes really are an excellent choice.